Head your browsers to Apple’s Development Center. 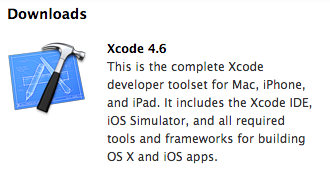 Apple has just released Xcode 4.6, with iOS 6.1 support (Release!). So far it has proven to be sooooo much stable. The previous release was a nightmare, specially during summertime. (Those of you who run Xcode on macbooks understand me… the entire machine turns into an iron!). However, i’ve been reading quite a lot of reports, from many different sources, pointing out that although 4.6 *freezes less*, it still has a couple of severe bugs, that will lower your productivity.